Each Sunday, Bob Gaughan recaps the college football weekend. Today, the focus is on the upsets in the Big 10, Bedlam in Oklahoma and the Irish heading towards a Hurricane. The fun game of the day was the Bedlam battle between Oklahoma and Oklahoma State. The over/under was 76 and the teams hit that by halftime (38-38). You got to hand it to the Sooners who pulled out a 62-52 win. This is their second huge road win. The other was in Columbus against Ohio State. Baker Mayfield threw for a school record 598 yards and five touchdowns. Mason Rudolph threw for 448 yards and 5 touchdowns. The Cowboys were down 55-52 with a minute to go and driving. The Sooners defense made the one stand of the day that made the difference. Sooners WR Marquise Brown set a school record with 265 receiving yards. Maybe last weeks contest between Penn State and Ohio State took a lot out of both teams. Both teams were upset yesterday. The Buckeyes were 21-point favorites and got rolled in Iowa 55-24. Pro prospect Josh Jackson intercepted JT Barrett three times. The Iowa offense erupted out of nowhere. They had scored just 27 points the last two weeks against Minnesota and Northwestern. In this game they had almost 500 yards of offense against the great Buckeyes defense. Penn State had to endure over a 3-hour weather delay in Michigan State. The game started at noon and didn’t end til after 7pm. Matt Coghlin hit a 34-yard field goal as time expired to give Sparty a 27-24 win. Saquon Barkley was held in check. He had only 63 yards on the day. Barkley’s grip on the Heisman appears to be slipping away. Michigan State plays Ohio State next week in a game that could decide who goes to the Big 10 title game. (1) Georgia clinched a spot in the Sec title game with a 24-10 win over South Carolina. Coming into the game South Carolina DB Chris Lammons said that Georgia couldn’t pass the ball. Georgia QB Jake Fromm responded by going 16 of 22 for 196 yards and two touchdowns. Georgia visits number 16 Auburn next week. (2) Alabama defeated LSU for the seventh straight time 24-10. The game was hard hitting. Three Alabama defenders left the game: star CB Minkah Fitzpatrick and LB’s Mack Wilson and Shaun Dion Hamilton. (3) Notre Dame offense continues to roll. 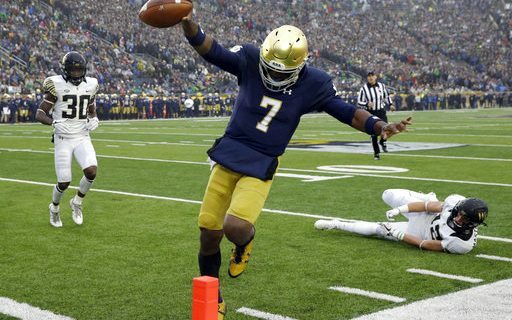 QB Brandon Wimbush gutted out a 390- yard day. He passed for a career high 280 yards and ran for 110. The Irish defeated a pesky Wake Forest team 48-37. There are two areas of concern for Notre Dame. Both Wimbush and star RB Josh Adams were banged up in the game and the Irish defense gave up 587 yards to Wake. (4) Clemson held on for a seven-point win in NC State 38-31. The Wolfpack started out fast as QB Ryan Finley hit his first 15 passes. NC State had a 21-17 lead at the half. Clemson took control in the third when Tavien Feaster ran 89 yards up the gut to give the Tigers a 31-21 lead. Finley had a chance to tie but was picked off in the end zone in the final minute. There will be no change in the top four teams this week. The Badgers and Hurricanes didn’t get much love from the committee last week. In spite of being undefeated the teams were 9th and 10th in the standings. Wisconsin blew by Indiana 45-17. The problem for Wisconsin is Indiana is 3-6 and 0-6 in the Big 10. This is another unimpressive win. Maybe a win next week against Iowa will mean more. Malik Rosier had the best game I’ve ever seen him play in front of a national audience and A-Rod and J-Lo in the stands. Rosier combined for three scores on the day. The Hurricanes cruised past Virginia Tech 28-10. Next week Miami hosts Notre Dame. Josh Allen was again Wyoming leading rusher as the Cowboys pulled out a 16-13 win over rival Colorado State in the snow. 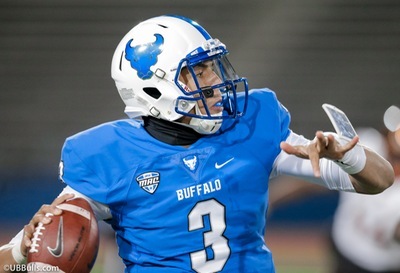 Allen had fumbled the series before leading Wyoming on a 69-yard drive for the winning score. Luke Falk led Washington State on a 94-yard drive in the fourth quarter to squeak by Stanford 24-21. He completed 34 0f 48 passes for 337 yards and three touchdowns. WSU outgained Stanford 430-198. This was the first time Stanford played in snow since 1936.